Join Functional Nutritionist & Intuitive Nourishment Guide Venessa Rodriguez for a deep dive training focusing on the Wild Terrain of Gut Health and Digestive Wellness. FEED YOUR WILD :: GUT is a virtual workshop designed to reclaim the wild resilience and robust health of our “second brain”... our gut terrain. For true health, you MUST tend to your “inner ecology” - your sacred internal garden that provides you with life. You cannot separate yourself from nature - you ARE nature and you are only as healthy as your internal landscape, so feed your gut ecology what it needs to flourish and thrive! 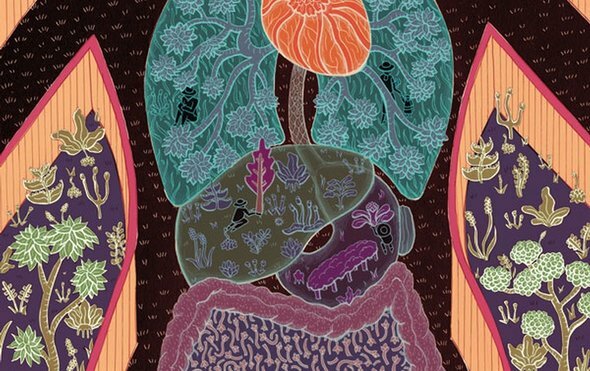 Think of your gut as one big ecosystem. Your microflora controls digestion, metabolism, inflammation and your risk of cancer. They produce vitamins, nutrients and molecules that sustain your health through a symbiotic relationship with you. :: You have chronic digestive issues that are holding you back, such as IBS, SIBO, bloating/gas, leaky gut, GERD/acid reflux, IBD like Crohn's and colitis & are looking for deeper holistic support and answers and relief. :: You've tried various therapies, treatments, diets, pills, and more on your own and are READY to take back ownership and power of your gut health + life. :: You feel blocked, stuck, or imbalanced in the energetic realms of the gut: personal will and power, grounding and stability, trust, vitality and energy. :: You are being called to go DEEP with your soul journey and work on levels of mind, emotions, energy body, and soul related to your gut challenges. :: You desire to lead a healthy sustainable lifestyle that supports your highest vision for yourself by getting to the ROOT of your gut issues, using a balanced blend of science, natural therapies & intuitive + energetic approaches. :: You desire to breakthru the fatigue, blast the bloat, calm the pain and feel good in your body again so you have more energy and vibrancy to do the things you’ve been wanting to do and live your life to the fullest. Specific steps you can take to begin restoring gut health working with the full moon. You will have access to all of the recorded workshop material for as long as it exists. Access to this virtual workshop does not expire. Access at anytime that is convenient for you... All you need is your digital device, journal, pen and earphones. Where: Online, gain instant access upon purchase & learn from the comfort of your own home! Feed Your Wild :: GUT :: Virtual Circle Workshop is a recording of a Live training and is available anytime. *ALL TRAININGS, WORKSHOPS AND EVENTS ARE FINAL SALE. REFUNDS NOT PERMITTED. "I had suffered from chronic sores and hidradenitis for 15+ years, didn't have consistent energy, I had extreme physical pain much of the time due to food reactions. I didn't know what was safe to eat or how to consume sufficient nutrients because of all my food reactions. I was afraid that nothing could help me because I had already tried so many things and worked with many health professionals. After working with you, my energy has increased and been much more consistent. I don't have so many negative reactions to food and when I do they're much less severe! I feel much more freedom to be active because I'm not in pain every day. You're wonderful, hopeful, patient, knowledgeable, understanding, realistic, and a great listener. I've already been recommending your service because I believe you can help improve many more lives just like you helped me. “It's been a crazy health ride these past 6+ years and I'm optimistic that I'll be healthier than ever if I continue down this path. Thanks so much for all your support, expertise and guidance. I don't know what I would have done without you and Dr. S earlier this year. I can't thank you enough for helping me regain and improve my overall health! I'm very optimistic that I'll be healthier than ever and set up for many, many more healthy years to come. Venessa Rodriguez, M.S., C.H.C. is a functional nutritionist, intuitive nourishment guide and host of the Feed Your Wild Podcast. Her mission is to awaken the innate healing capacity of women struggling with chronic dis-ease, by reconnecting them to their own medicine and nature through food, spirit, and love. Venessa supports wild-hearted changemakers build physical health & vitality through her work combining the science + spirituality of food using a modern functional approach, intuitive guidance with Akashic Records, and ancestral nutrition + wisdom from earth-honoring traditions. If you’re struggling with chronic dis-ease, listen to her free Sacred Ecology Activation Journey to help you uncover what’s been keeping you stuck in your health & life, and discover what “foods” to bring in right now for radical nourishment & clarity. Connect with Venessa on Instagram and at Wildly Rooted to receive daily nourishment for body, mind, and soul.